Don’t you hate it when you’re frantically working away on battery power, watching that little icon drain with no electrical outlet in sight? It can be a nerd nightmare but thankfully, most major operating systems have a battery-saver utility — or at least some settings tweaks — to help you squeeze out a few precious minutes of juice until you can recharge. Here’s how. 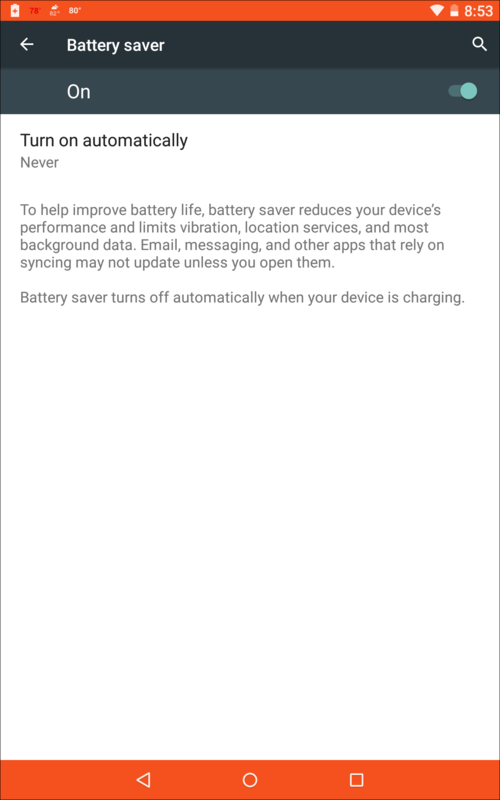 The Battery Saver mode in Android 5.0 (Lollipop) is supposed to add an additional 90 minutes of device life by temporarily putting a stop to mail and message syncing, vibrating alerts and other power-draining activities. To turn it on, open the Settings icon from the apps screen, select Battery and then tap the three-dot icon in the upper-right corner to get to Battery Saver in the menu. (You can also swipe down on the home screen to get the Quick Settings box and then jump to Battery preferences from there.) Once in the Settings, you can turn Battery Saver on or off manually, or have it automatically kick in when the battery is down to 5 or 15 percent of its power. You can find third-party apps that claim to boost your battery, but some Android phone-makers have their own tools — Samsung, LG and HTC are among them. Tech sites like AndroidPit usually offer advice for saving energy, too — like using dark wallpaper on your gadget. Got a Lumia? Microsoft has its own Battery Saver mode for its Windows Phones you can use to achieve similar savings. As announced a few weeks ago, Apple is adding a new Low Power Mode feature in iOS 9. Until then, the company has a page of tips for prolonging your battery’s charge, and a bunch of apps in the App Store to help you monitor and manage your power consumption. Like other versions before it, Windows 8.1 lets you set up an alternate power plan that automatically dims the screen and tweaks other settings to save battery life when you’re not plugged into power. Likewise, Apple has a page of tips for OS X Yosemite and its own power plans for laptops. 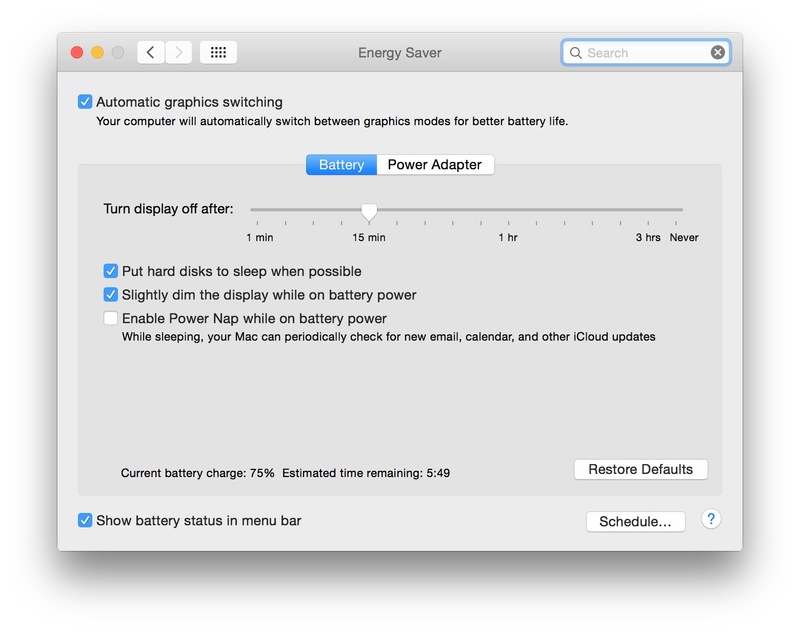 Apple’s site suggests several ways to adjust your Mac’s Energy Saver preferences (shown here) to get a dimmer display, automatic graphics switching and other tweaks that take less of a hit on your MacBook battery. If you’re a Linux user, you probably have similar settings in whatever distribution you use. Ubuntu’s community documentation has suggestions and the third-party TLP power management tool works with Ubuntu and Linux Mint. When used in time, some of these little tricks can save you a few minutes of juice here and there. If you find your battery is always edging into the red, consider a replacement or even an external power source to keep you going until that next electrical outlet appears like an oasis in the desert.